The City of Doral was incorporated on June 24, 2003 and is located between the Palmetto Expressway and Florida’s Turnpike, south of the Town of Medley, one mile north of the Miami International Airport, and minutes away from Downtown Miami. 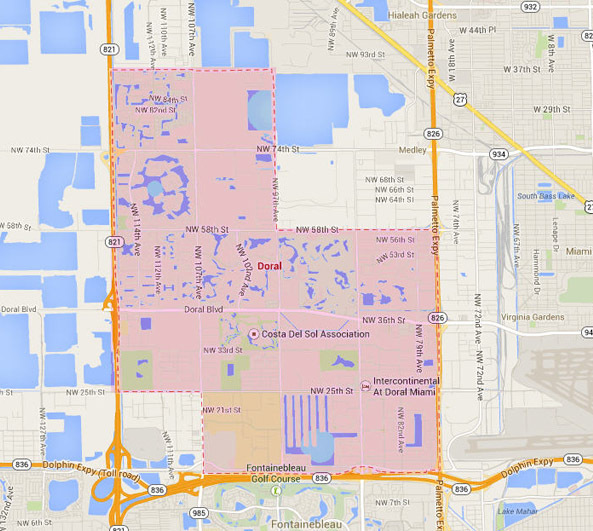 Doral is home to over 46,000 residents and occupies a land area of 15 square miles. The area has multiple private gated communities of townhouses and homes, most built within the last 20-30 years, some of which have views of a golf course and other amenities. The history of Doral begins in the late 1950s with real estate pioneers Alfred and Doris Kaskel, which purchased 2,400 acres of swamp land for about $49,000 with the intention of building a golf course and a hotel. They opened a hotel and country club in 1962 and named it Doral, a combination of Alfred and Doris. The Doral Hotel and Country Club became the area’s hot spot and in the second year of operation, the Kaskels hosted the first Doral Open Invitational, Florida’s major PGA event. Today, the Doral Golf Resort and Spa is well renowned for its golf courses and hosts the annual PGA Tour Tournament. During the early 1980s, Doral began to grow and the Kaskels grandson, Bill, developed Doral Estates which was later followed by a joint venture with Lennar Homes to build Doral Park. At the time, most homes were purchased for investment purposes or second homes and there were no stores, schools or parks. There were more farms with cows, horses and chickens than people. The quality of life and low housing costs exceeded the lack of amenities. During the mid 1980s, the area experienced a building boom. The process of incorporating the community began in 1995 since residents were paying a very high price for services received. Doral was known as a “donor community” because the taxes paid were more than the cost of operations. In January 2003, 85% of the voters in Doral voted in favor of incorporation. Today, the City of Doral attracts attention from its small businesses, large corporations, young families and retirees. It is recognized as the center of international trade and commerce. Doral offers one of the best educational systems in the area, with several schools being rated as an “A” for academic achievement. Some top rated schools in this community include Doral Academy Charter High School, Doral Performing Arts and Entertainment Academy, Renaissance Elementary Charter School, and Doral Academy of Technology. There are multiple options for shopping and dining in the Doral area. Miami International Mall has retailers like Macy’s and Sears. The large food court offers a variety of cuisine options as well as the restaurants within the mall and surrounding the mall. Dolphin Mall is minutes from Miami International Mall and features a cinema, restaurants and outlet retailers. Both of these malls host several events throughout the year for the community to enjoy. Some of the parks within Doral include J.C. Bermudez Park and Doral Meadow Park. J.C. Bermudez Park is an 82-acre park and the largest park in the city. The park hosts major events throughout the year such as an Independence Day celebration. It has open green spaces and scenic lake views, an exercise station, grills, a walking trail, and picnic benches available for rental. Doral Meadow Park is a 14 acre park designed for sports with something for everyone. There is a concession stand, lighted playground, vita course, two soccer/football fields, two baseball fields, batting cages, a walking/jogging trail, and a bikeway. The City of Doral offers a wide range of services and is an exclusive place to live, work and play. According to Forbes, Doral has been named #2 of America’s Top 25 towns to live well for its cultural amenities, pro-business environments, and highly educated workforce. The community has established world-class parks and cultural activities. Hotels average over 85% occupancy rate because Doral is a popular destination in South Florida. Doral provides a superior quality of life in an urban center known for its commerce. If you have any interest living in Doral, contact us and we will assist you with your real estate needs.